The presentation is part of the Pro Football Hall of Fame’s new program, in which Hall of Famers will be presented with a historical “Hometown Plaque” in their hometown. Presented by Allstate Insurance, the program honors the roots of the players’ great careers, and promotes the positive values of the sport. There have been only 267 members inducted into the Pro Football Hall of Fame, from the more than 21,000 athletes who have played for the NFL. 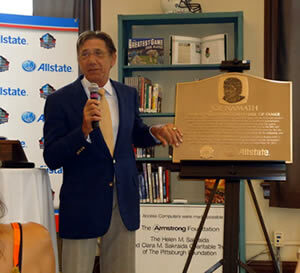 Joe Namath will be one of the first to be honored with a Hometown Plaque. The plaque will be on display at the Larry Bruno Foundation Hall of Achievement for the remainder of the year before being placed in a permanent display. In its day-to-day operation, the Pro Football Hall of Fame works very closely with all facets of the pro football family – the National Football League, the 32 NFL clubs, and other entities to ensure the overall success of the Pro Football Hall of Fame. In turn, the Hall strives to serve as the best possible historical showplace and repository for the sport of pro football. The Hall of Fame is a 501(c)(3) not-for-profit educational institution that focuses on education, promoting, preserving, and honoring the great individuals and moments that have shaped the sport’s history. The Allstate Corporation (NYSE: ALL) is the nation’s largest publicly held personal lines insurer. Widely known through the “You’re In Good Hands With Allstate(r)” slogan, Allstate is reinventing protection and retirement to help nearly 16 million households insure what they have today and better prepare for tomorrow. Consumers access Allstate insurance products (auto, home, life and retirement) and services through Allstate agencies, independent agencies, and Allstate exclusive financial representatives in the U.S. and Canada, as well as via www.allstate.com and 1-800 Allstate(r).